SAN FRANCISCO, CALIF. — Emerging from an industry saturated with apps and wearables, San Francisco based startup MOTI (www.moti.io) is seeing tremendous support on Kickstarter, exceeding a goal of $50,000 within the first five days of launching. At 23 days left on the campaign, MOTI has over 700 backers, and has now released additional “stretch goals” for their little robot. These goals include adding a wild card color that backers can vote on, integrations with Fitbit, Evernote, and Google Calendar, as well as a new top secret feature – should the campaign reach $175,000. Who is this little robot and why is everyone so intrigued by him? First, MOTI is a physically present smart companion for building better habits. The device combines insights from behavioral science, social robotics and human-centered design, and is built to learn and react to human beings’ psychological triggers with the purpose of getting them to start practicing healthy habits (such as jogging, hydrating, meditating, etc). Second, what makes him different is that unlike a standalone app, MOTI’s very physicality, presence, and emotional AI contributes to his ability to effectively influence behavior. 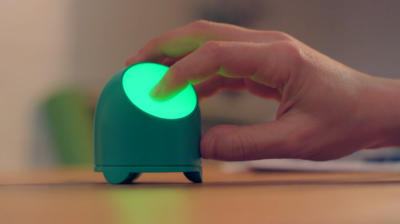 Standing at just under three inches tall, MOTI acts as an ever-present environmental queue that is meant to interact with you in the moments and places where you would normally start forming your habit (i.e. your kitchen, your work desk, your yoga space,etc.). The science and design behind MOTI’s habit-forming influence draws from the habit-loop theory, which explains that in order to build any habit, three things are required: a trigger, a routine, and a reward. To help you form your habit, MOTI supports all three things through a combination of lights, haptics, human-like intonations and other sounds. In order to have the best effect on behavior, MOTI is also designed to form a bond with the user, and his personality is continually adapting to the users’ needs. Live demos are available today at BulletProof Bio-Hacking conference, and customers can now pledge an order for their own MOTI at http://kck.st/2d8NBu2 , on sale for $99 each and available in light grey, dark grey, and turquoise. MOTI is a behavior change company combining science and design to create transformative products that help people live better lives, one habit at a time. Established March 2015 in New York City, the company is led by Founder and CEO Kayla Matheus (Yale BA’11) and Founder/COO Laura Day (Vanderbilt BE’02, Harvard Business School MBA ‘09). MOTI is an alum of Google 30 Weeks and Highway1 Accelerators. Connect with MOTI via Facebook, Twitter, and Instagram (@habitMOTI) or visit www.moti.io to learn more. Dieser Eintrag wurde veröffentlicht in Crowdfunding, Development, English, Fun, General und verschlagwortet mit health, healty habits, Kickstarter, MOTI, Robot von Sebastian Trella. Permanenter Link zum Eintrag.